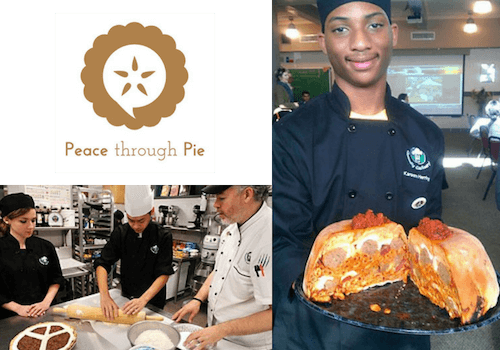 This Peace through Pie Social was a districtwide No Place for Hate activity, so chef instructor Mike Erick­son's students, Connally's nutrition students, and the kids who work in Connally's Cougar's Catering spent more than a week making pies in anticipation of hosting 500 people at the school cafeteria. Students, teachers, parents, and members of the community were invited to bring pies and/or contribute pie recipes to a community cookbook that will raise funds for the culinary program. There will be musical entertainment and an oral history booth. This social is a districtwide No Place for Hate activity. Because there are 30 different ethnic groups represented in Connally's student body, chef Erickson made sure his pie curriculum focused on all of the diverse dishes that can be considered pie – be that a classic banana cream pie, an empanada, a samosa, a pastelito, or a pizza. "Last year, one of our senior students Jeleun Foster, created a timpano, inspired by the Italian part of his heritage (image above). It just knocked everyone out, and expanded their ideas about what a pie can be. We're looking for more of that this year," Erickson told us.